Stylish Sunburst and Atomic mid-century wall clocks are as popular today as they were when first introduced in the late 1940s. Clocks such as these served not only as timepieces, but were (and still are) considered wall jewelry in a home. They’re truly symbolic of mid-century style and are a focal point of a room. The modern designs of these clocks are reflective of the Modernist movement that began in the late 1940s. Modernism is the idea that form follows function, rather than creating a functional object with a heavy influence on making that object decorative. 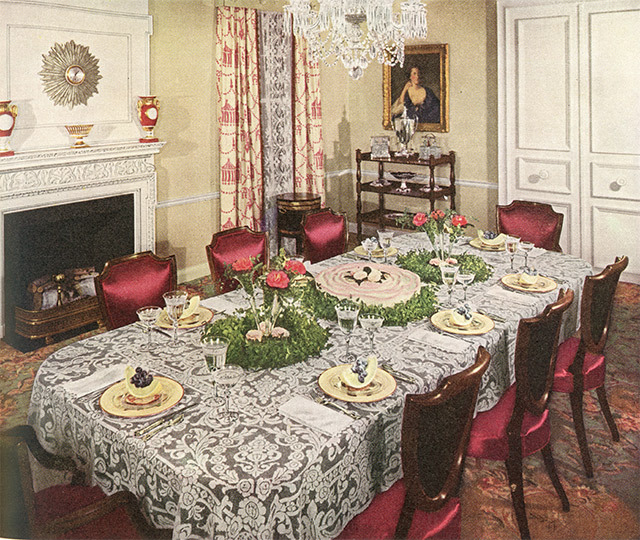 A George Nelson style Sunburst clock is featured over the fireplace in this 1939 American Home magazine photo. Credited with helping to introduce the movement to the United States was George Nelson and his design group, George Nelson Associates. Born in Hartford, CT in 1908, Nelson graduated from Yale University in 1928 with a degree in architecture and later, in 1931 with a degree in fine art. In 1932 he won the opportunity to study abroad for two years. Attending the American Academy in Rome, Nelson became familiar with the European avant garde style (meaning experimental) and later incorporated this look into his designs for American furnishings in the U.S. Through the 1930s and into the early 1940s, art deco had been the preferred aesthetic for home furnishings. George Nelson’s goal was to re-imagine what had been done in the past, and create new looks using a Modernist approach. Of course furnishings needed to be functional, but they could also be art—with sleek lines and vibrant colors, done in new ways that hadn’t been seen before. In 1947 Nelson launched Nelson Associates in New York City. They designed furniture for Herman Miller as well as clocks for Miller’s son, Howard Miller. Artists comprising the Nelson Associates group included celebrated designers such as Irving Harper (very prolific industrial designer), Don Ervin (graphic designer) and Charles Pollock (industrial designer, designer of the Pollock chair). Their collaboration resulted in groundbreaking designs that are still featured in furniture and clocks today. Among these iconic designs, it’s the clocks we’re concerned with today, and we have a few favorites. A reproduction Ball or Orbit Clock created in the George Nelson style. The Ball Clock was designed by the Nelson Associates for Howard Miller Clock Company in 1948. It was an atomic style clock with wooden balls marking the hours of the day. (The name ‘atomic’ given to the design, as it resembled the structure of an atom.) The original release of the Ball Clock included 12 brass spokes with wooden balls at the end, available in six different colors. An ellipse served as the tip of the second hand, and a triangle for the hour hand. The story of the original design concept for this clock as told by Nelson, was that he and two other designers, Bucky Fuller and Isamu Noguchi were brainstorming designs over drinks and each was taking turns sketching on a roll of drafting paper. The following day Nelson reviewed the sketches and loved the Ball Clock design, although none of the men could remember who had actually drawn it. 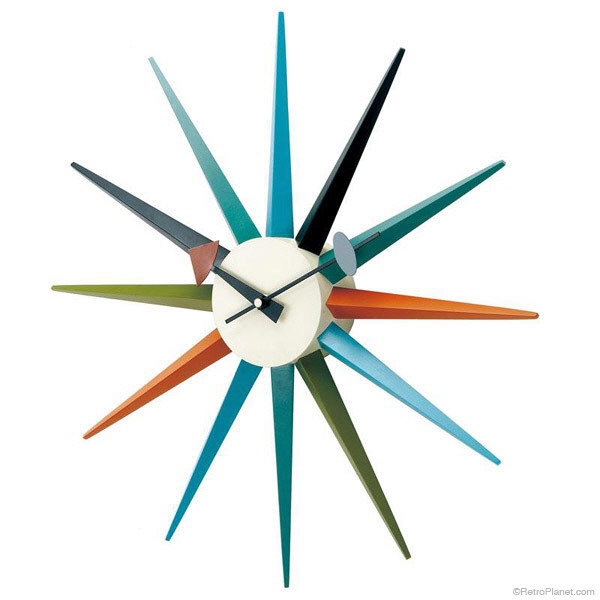 The Sunburst (or Starburst) Clock is one of the most iconic of the mid-century clock designs. More than likely, this is the clock you see when you envision the ‘50s inspired room of your dreams. The original design was conceived by Nelson Associates in 1949 and is the most recognizable of their clock designs. 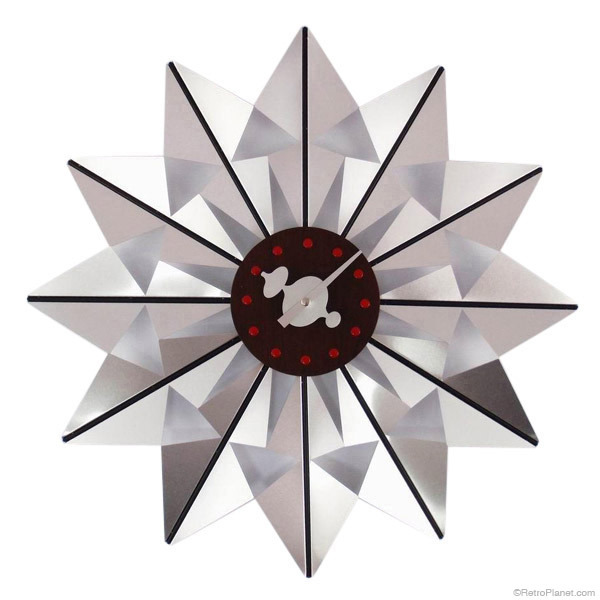 This reproduction clock pays tribute to the original Sunburst Clock design created by George Nelson. American Home magazine ad (Nov. 1956) featuring a George Nelson Butterflies Clock hanging in a stylish mid-century kitchen. In addition to the Ball and Sunburst clocks, Nelson Associates created the Butterfly Clock in 1955. 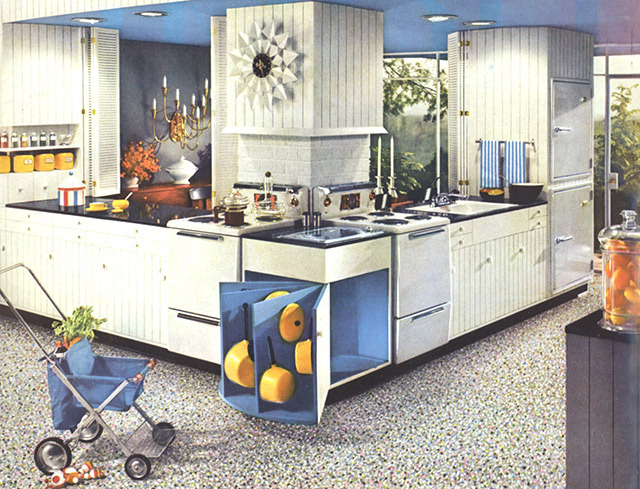 This design reflected not only the Modernist movement, but the optimism of the mid-1950s. Originally made of reflective aluminum, George Nelson always had an eye toward taking mundane household objects, and recreating them in a whole new way. Who says function and beauty don’t can’t go together? The George Nelson style Butterflies Clock reflects the ideals of the Modernist movement, as well as the optimism of the mid-1950s. 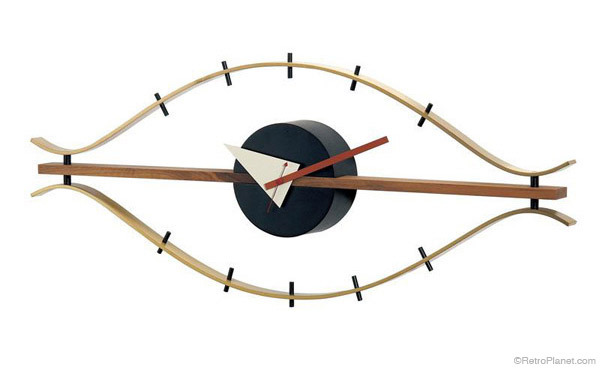 One of George Nelson’s most innovative clock designs is seen in the reproduction Eye Clock. Today many of the enduring mid-century clock designs are available in reproduction clocks. You can get an officially licensed George Nelson reproduction clock, but these run in the several hundreds of dollars. For a less expensive version with the same great style, there are many other options available for mid-century style clocks to add dynamic style to your wall decor. 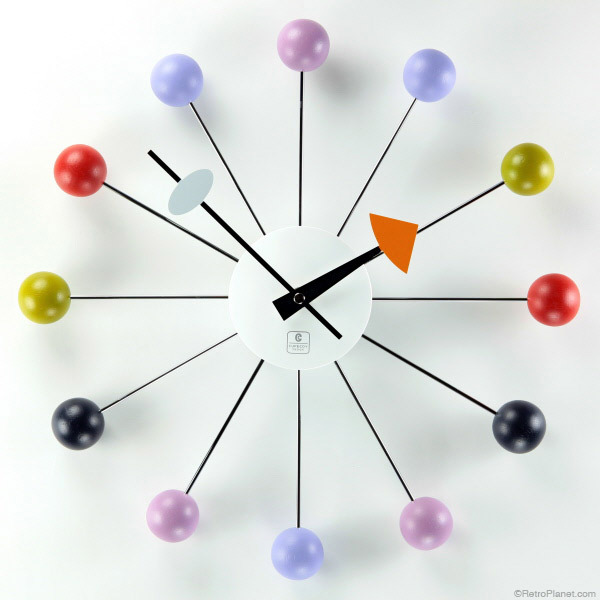 Share with us what your favorite mid-century clock style is. We’d also love to see photos if you display one of these in your home.